The A.P.E.X. Event Series is proud to present the superintendent of Zion National Park, Jeff Bradybaugh. The event will focus on what a day can consist of in National Park Ranger service. With over 35 years of experience in U.S. parks, Jeff Bradybaugh has a unique view of our Utah parks system. 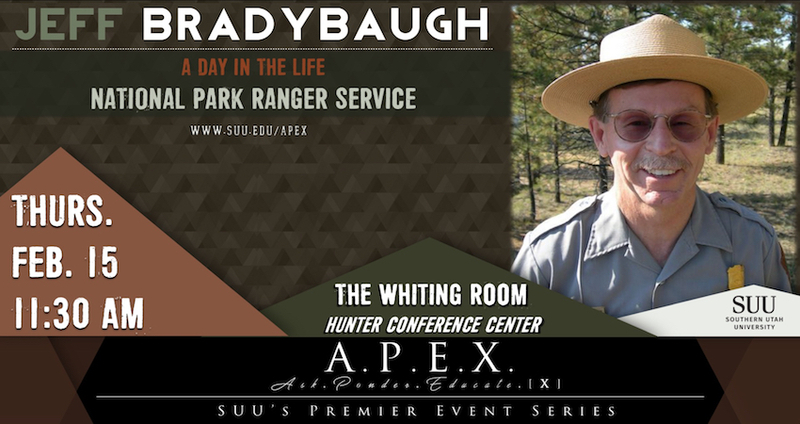 You can hear Bradybaugh speak on Feb. 15 at 11:30 A.M. The event will take place in The Whiting Room in The Hunter Conference Center on SUU’s campus. Please check www.suu.edu/apex for details about the event. This event is free and open to the public. Before his position as superintendent for Zion National Park, Bradybaugh served as superintendent for Bryce Canyon National Park from October 2010-14. His other work with the NPS has consisted of positions in Arizona, California, Kentucky, and North Dakota. Bradybaugh entered the NPS with training as a forestry technician and wildlife biologist. Bradybaugh is responsible for the overall maintenance of Zion National Park and how the park can receive visitors. In 2016 Zion National Park was the sixth-most-visited park and had a record breaking 3.7 million visitors. The superintendent of Zion National Park is responsible for over 148,700 acres and an annual operating budget of $7.24 million. Bradybaugh earned a Bachelor’s Degree from South Dakota State University in wildlife and fisheries management, and a Master’s Degree in wildlife biology from New Mexico State University.